To the west of Tottori, Shimane Prefecture faces north across the Sea of Japan to ancient trading partners China and Korea, while the southern boundary is aligned along the Chogoku mountains of south west Honshu. 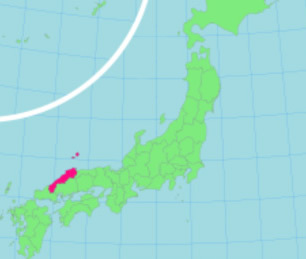 Although 18th largest in area, it is the second least populous prefecture of Japan, with a population of less than 800,000. Population density is 110.6 people/sq.km against a national average of 338.1. Retailing (over 60,000 workers) and manufacturing (49,000) are the largest employers. Of the three regions of Shimane, Izumo is deemed culturally most significant and is home to the prefecture capital, Matsue (pop. 196,000), situated on the shores of Lake Shinji. In Japanese folklore, Izumo is the legendary realm of the gods and birthplace of much Japanese mythology. The Oki Islands in the Sea of Japan, historically used as a place of exile for such important notables as out-of-favour emperors, are part of Shimane Prefecture and are the focus of an important fishing industry. Among official Shimane symbols, the mountain peony is the prefectural flower. Only 6% (41,000 ha) of the land area is arable and 80% of this is dedicated to rice production, mainly on the Izumo plain. About 80% of the entire prefecture is a carefully managed mountain forestry. As in other parts of the Chogoku region, depopulation of the rural precincts has detrimentally impacted agriculture and this is being addressed with government sponsored programs to re-invigorate traditional practices in horticulture, dairying and beef calf production. Numerous specialties include the production of the purest soba flour for noodles, Shimane (Wagyu) beef, and Oki oysters. Lake Shinji is a prolific source of seafood delicacies as well as a tourist attraction – there is an official calendar for the observation of Shinji sunsets. Tourism and religious pilgrimages are popular in Shimane. Izumo Taisha, an ancient, undated Shinto shrine dedicated to the deity of marriage and a focus of the Shinto creation story, is a hugely popular national attraction. Matsue castle – the black or plover castle – is one of the few remaining medieval castles in Japan. Hosting a multitude of festivals each year, the prefecture is a foodies’ paradise with local delicacies ranging from the finest noodles to seafood to Wagyu, roasted seaweed (nori), traditional sweets, sakes and wines. 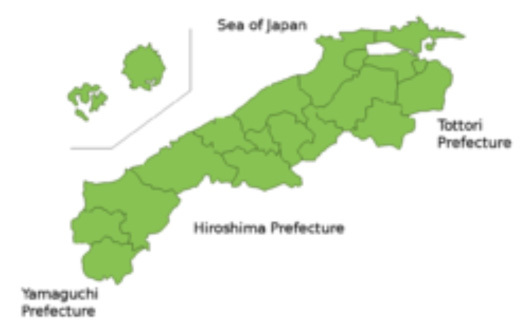 Part of the western Chogoku region, Shimane shares the cradle of the Japanese Black with Tottori, Hyogo, Okayama and Hiroshima, including a history of Wagyu production dating back to native Mishima cattle. During the 19th century period of foreign genetic experimentation, Shimane saw introductions from Simmental, Devon, Brown Swiss and Ayrshire herds –a considerably broader infusion than either Tottori or Okayama. Similarly, in the 20th century, Shimane breeders were early adopters of the current national breeding strategy – reaching out to acquire outstanding genetics from neighbouring prefectures to improve local herds rather than single-mindedly focusing on Shimane tsuru. Contemporary Shimane bloodlines commonly form a base in cow herds where superior growth and milk are targeted, sharing the creation of a maternal genetic platform with Tottori and Okayama females. Shimane carcasses feature prominently in national competitions and a steady flow of annual sire registrations is continuing. • Morimoto Line. Utilising a female bloodline procured from Tottori, this line originated with “Dai 2 Morimoto” and continued with leading sires “Dai 9 Morimoto”, “Syouwa Morimoto”, “Shouei”, “Dai 2 Shouei” and “Dai 9 Nita”. Excessive gestation periods and undesirable progeny body types led to the cessation of the line in 1945. • Riku-un Line originated with “Dai 4 Riku-un”, son of a Hikouemon tsuru sire bred in the Nita district. “Dai 22 Takagawa” was one of many leading sires in this line, which dominated Shimane breeding for over 20 years. In mid- 1960’s, the Kurahana and Fuku-Izumi sub-strains took ascendancy in sire production but female production continued on original Riku-un line genetics. • Kurahana Line originates with Dai 4 Kurahana. Dai 4 Kurahana was the progeny of a Riku-un line-bred dam and the sire “Sampou” from Okayama prefecture, used in Shimane between 1952 and 1966, and a substantial contributor to prefecture herd improvement. Dai 4 Kurahana produced 73 bulls and became the most productive single sire in Shimane Wagyu history, with an outstanding contribution in the suppression of undesirable phenotype-influence genetics which had troubled traditional Shimane production. Today, Kurahana is the only important early sire line continuing in modern Shimane Wagyu genetics. • Fuku-Izumi Line originates with the sire Fuku-Izumi. 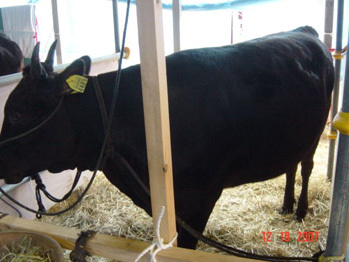 Fuku-Izumi was bred by “Hidemoto” (progeny of Naka-Doi line bull “Hidekuni” and the Tottori female “Morimoto”) and Riku-un line female “Nito Dai 3 Fukuei”. “Hidemoto” was small framed but good hair typed animal. “Fuku-Izumi” was larger than “Hidemoto” but smaller than other Nita district animals. • Shiro-Matsu Line originates with the Tajima bull “Shiromatsu”, progeny of “Shiro-Doi” (Tajiri) and “Matsuyoshino” (Oku-Doi). Subsequent significant sires were “Dai 2 Fuku Hana” and “Dai 3 Kai-Un” – being the sons of “Shiro Matsu” bred with females by “Hidemoto” (of the Fuku-Izumi Line above). Few Shiro-Matsu bulls were bred and the sire line is defunct in Shimane breeding, but a strong heritage remains in Shimane cow herds. Founded on the sire “Hakutagawa” in Nougi District, Hikouemon-Tsuru was renowned for long-lived fertile females with good maternal characteristics. A sub-branch included the Fuku-fuku line. Relatively short-lived, the Tamayama line originated from “Dai 3 Tamayama”, born in 1918 with 2.5% Devon content. Large frame and straight back line were the major characteristics. Low marbling and some (perhaps not surprisingly) brown hair progeny limited line development. As with Okayama Wagyu, the major role of Shimane genetics in contemporary Japanese fullblood production is in broadening the genetic base for cow herds, with desired contributions being larger frame size, maternal capabilities and growth. However, although dominating both prefectural female and sire production, the outstanding contemporary Shimane sire, Dai 7 Itozakura, does not derive from Shimane tsuru. Instead, the foundation sire of the Modern Shimane Itozakura line was the result of breeding using Tajima and Okayama genetics, undertaken in Shimane. – ‘Harumi’ a Tottori son of “Dai 2 Kedaka” by “Wadatoshi”, from Yazu district in Tottori. A strong growth, large frame animal, he demonstrated strong heritability with average progeny ADG 0.9kg. Also prominent from the Kedaka line are ‘Kensei’, son of ‘Harumi’, prominent in Shimane female production; and ‘Hirashigekatsu’, sired by Dai 20 Hirashige sire but bred in Kagoshima. – ‘Dai 14 Shigeru’. A son of “Dai 6 Fujimori”, a prominent sire of the modern Okayama “Fujiyoshi Line” and in the same sire lineage as Dai 7 Itozakura. – ‘Shigeshigenami’ (Sired by Shigekanenami), a Hyogo import. – ‘Yasuhira’ (Sired by Yasufuku). Another Hyogo import used mainly in female production. In terms of seedstock production: of 886 sires registered in Japan in 2007, Shimane sponsored 29 – and again Itozakura influence prevails over the residual Kurahana . Calf production in Shimane totalled 8320 head in the year July 2006 – June 2007. In competitions, Shimane bloodlines saw significant success in carcass events through sire Kitaguni 7/8; and in calf production sire selection through Dai 1 Hanakuni. Both are more than 70% Shimane breeding when the Itozakura strain is included. In contemporary Japanese fullblood production, the crowning achievement of Shimane Prefecture breeding is Dai 7 Itozakura, bred from Okayama Fujiyoshi and Hyogo genetics, and the founding sire of the Modern Itozakura bloodline. Although Shimane tsuru influence does not appear significant, as a result of Dai 7 Itozakura, Shimane prefecture breeding has had massive national impact. What are the significant differences between the Modern Shimane Itozakura line and the Modern Okayama Fujiyoshi line ? Click here for discussion.